I'm going to start an a320 home cockpit and i want to know what joystick can i use as a sidestick. I'm looking to the constructor webs, but i can decide. Could you help me? does that go into you pc ? For $20,000 you can buy the flight deck of an A320 at Desert Air Spares. (I believe their site is desertairspares.com, maybe?). Shoot by an e-mail to the guys and see if they have an A320 in stock. Doing the math, if you were not to buy a real A320 flight deck and were to buy stuff from Flight Deck Solutions and Project Magenta, you'd have to pay for the chairs, the rudders, the framework and lights, shell, etc which will be just about $25,ooo. Buying an A320 will get you all of that and the carpet, the cockpit window/glass, authentic chairs/yokes/switches/nobs. Plus the nose, weather radar, comms/radios, and everything else in that nose section worth who knows how much for only $20,ooo. Hey, if you were to sell the radios/weather radar and unessentials you'd probably be able to pay off the airplane buy all together anyways. I'd say look into that and other options before diving forward - there are a lot of ways to get an authentic and badass A320 sim. Trust me, i've helped make one. "does that go into you pc ?" USB plug and play it says. I wish I had the $$€€ to buy more stuff from Flight Deck Solutions. Try http://sim.itra.de/default_en.htm. They have a sidestick that you can mount on to a joystick. http://www.final-app...fs-cart-FA.html (scroll down, and bottom right). I don't have one, but it looks pretty good. Maybe airsimmer could team up with a hardware manufacturer and sell a special package with an authentic sidestick AND the software... 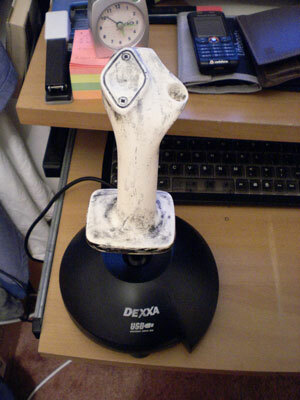 Most PC joysticks feel too flimsy compared to the real thing. [url="http://www.final-approach.co.jp/FS-Final-Approach/fs-cart-FA.html"]http://www.final-approach.co.jp/FS-Final-A...fs-cart-FA.html[/url] (scroll down, and bottom right). I don't have one, but it looks pretty good. I would use the Saitek Pro Flight throttle. It's very "A320", it has detents for reverse, its black and its CHEAP! 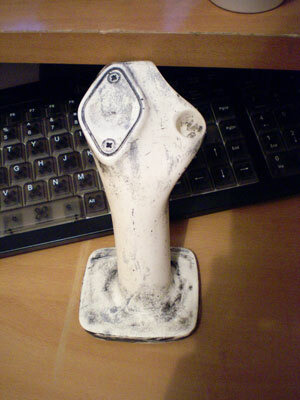 Also the Logitech Attack 3 joystick is the closest you will find to an Airbus look if you don't want to spend heaps. It's also both left and right handed. Don't you think this one is more for Prop Aircraft? Flight Deck Solutions. The FMC came using old Playstation parts for it (The interior), and the throttles unfortunately didn't have a functioning trim wheel (Which we were able to make work). I wouldn't use'em again, took 1 1/2 years for them to send it.. It has interchangeable heads, so you can put 2 black and get rid of the other one.